Home » The Holiday France Direct team’s favourite family days out in France! The Holiday France Direct team’s favourite family days out in France! The HFD team got together to recommend our favourite days out for your holiday that are great for adults and kids alike. There are so many wonderful places to visit it was hard for us to choose just one each! We’d love to hear your favourites too so why not join us on Facebook or Twitter and let us know your recommendations? Boat rides to Ile de Batz depart regularly from the Old Harbour in Roscoff throughout the day all year round, with sailings every 30 minutes in peak season. There is no need to book ahead, just turn up on the day. The crossing to the island takes around 15 minutes. As well as lovely unspoilt beaches and the tropical gardens this beautiful island has plenty of walking trails you can use to discover the island chapel, lighthouse and the Trou du Serpent rock formation where legend has it St Pol cast a dragon into the sea! This huge bi-annual maritime festival attracts thousands of ships to the area and offers lots of events, parades and concerts at many towns along the coastline. The full details of the 2019 event are yet to be revealed but check the website and Facebook page for details as the date approaches. Vannes, Locmariaquer, Arzon, Port-Navalo and Larmor-Baden all hosted major events in the 2017 calendar and the whole area is involved in the celebrations, so booking a cottage in the region is a great idea for a family holiday! Disneyland Paris offers all the Disney magic without a long haul flight – ideal for young children and conveniently located if you want to visit for a day or two on the way to or from a villa holiday in southern France. If you want to meet the characters without a huge queue it is well worth booking a meet and greet breakfast at the Plaza Gardens or a meal with the princesses in the Cinderella restaurant, it is expensive but watching your children chatting with their favourite storybook star is wonderful! From the amazing parades to exhilarating rides and the atmospheric staging of the different lands, Disneyland Paris will melt even the most cynical parents heart and make your children’s dreams come true! The Tour de France is an iconic annual event in France with a different route each year. The 2018 race takes place from 7th – 29th July and travels through Normandy, Brittany, the Loire, Pyrenees, Languedoc and Alps. The cyclists can whizz by very quickly but if you pick mountain stages where the riders are slower, or time trials where the riders go by individually, you can see more of the action. All the towns and villages on the route will be full of celebrations and you’ll enjoy a wonderful, fun, festive atmosphere if you stay near the route for your holiday! 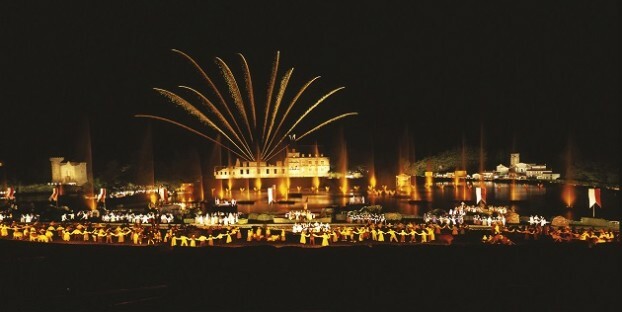 Puy du Fou is a historic theme park with a difference – there are no rides, instead there are thousands of actors and actresses recreating historic events in a series of shows, demonstrations and installations. The park is renowned for the spectacular evening show Cinéscénie that uses music, lights and thousands of players in a breathtaking extravaganza! It’s a really good idea to book tickets ahead of time, especially for the evening shows, as they book up really quickly! Puy du Fou is a fascinating, immersive experience that all the family will love – and new for 2018 is the Mysterious Voyage of La Pérouse, an exciting new presentation based on the explorer ship from Brest lost at sea in 1785. We hope you get a chance to take your families to see some of our favourite places next time you go to France, and don’t forget, if you book accommodation with us you’ll get 20% off your Brittany Ferries crossings. Ten family events in France to make your 2018 holiday extra special! Follow Holiday France Direct on Pinterest!